Disney’s been on a pretty strong streak of late, with their last three films (‘Frozen’, ‘Big Hero 6’ and ‘Zootropolis’) all delivering strong and smart storytelling for all the family. In my opinion, ‘Moana’ is the best of the lot, and I really liked the other three. ‘Moana’ perhaps lacks the pure singalong knack of ‘Frozen’ or the smart social commentary of ‘Zootropolis’, but it’s got something special and I was swept away in this wonderful piece of good, old fashioned storytelling. After a bit of backstory, we join the small island community of Motunui where we’re introduced to the titular Moana (Auli’i Cravalho), the daughter and heir of the island’s chief (Temuera Morrison). It’s presented as a happy but insular community, afraid of the ocean surrounding it and heavily reliant on making use of the plentiful resources on the island, until one day the resources start to dry up. This leads Moana on a quest to locate the demigod Maui (Dwayne Johnson) in order to save her people. 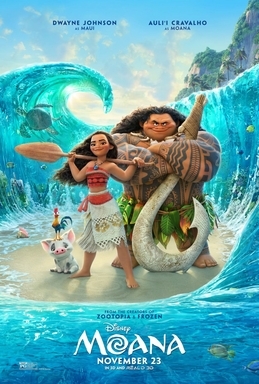 ‘Moana’ has a fairly conventional narrative, particularly once Moana locates Maui, as the duo team up to defeat several villains and complete a couple of key tasks, but the fresh setting does lend something extra to the material. I thought the music was absolutely wonderful, uplifting and melancholic, and the track featured heavily in the trailer really sends a shiver down my spine. Moana is a strong character and she’s well voiced by newcomer Auli’i Cravalho, equally good at singing as she is at bringing the character to life. Dwayne Johnson injects a bit of lightness and fun into Maui and they form an entertaining double act, whilst there’s enjoyable support from Rachel House as Moana’s grandmother (I only just clicked that House also played Paula, the main social worker, in the terrific ‘Hunt for the Wilderpeople’ earlier this year too) and Jemaine Clement as a treasure hoarding crab. The cinematography is luscious and is further evidence of the increasingly high standards of animation studios today, with the shimmering ocean beautifully brought to life to compliment an already radiant and colourful palette. ‘Moana’ is a beautifully designed animation from Disney that manages to hit some real emotional beats within the confines of a simple piece of storytelling, and I found this to be one of the most uplifting and purely enjoyable cinematic experiences of recent times. It’s rare I come out of a screening and want to see a film again, but I feel like I may make that exception for ‘Moana’.